With the decision not to get a new car until late summer, I finally opted to get my winter snow tires off the hybrid (I know, its May). Mileage week1 was 67,69,68mpg on the commutes, but today I decided to hypermile it. The Inisght needs an oil change, and I think the tires are a little under inflated from the tire shop (I run them FULL) so I was “only” able to eck out a 97.4mpg on my first attempt of the year (ha!) I had 101.4 at about 17 miles into my 19 mile commute, but the final 2 are in town (3 stop signs) and uphill which kills it. My record commute of 102.2 last year I had about 106 heading into town. Interestingly that trip was also in mid May-something about the warm spring air and longer days I guess. I will change the oil this weekend, and correctly inflate the tires, which should push me back into 100mpg again. It is noteworthy that the fine muscle skills needed to feather the throttle to that level lead to calf cramping and soreness on the “go” leg when I am out of practice. With the tires running more resistance and the oil a little thicker, I had to drop my average speed into the low 40’s from the low 50’s of last year, but I still made it from work to home in an internal combustion engine, on decade old technology, and averaged almost 100mpg. It is going to be damn hard to sell this car. To that end, I am actually considering blitzing another 100 rain barrels, despite no free time with the farming, to earn $10k to pay off the Insight and earn enough to give $4k down on a 4 door hybrid. Yes, I realize how insanely blessed we are to have the choice or whether or not to make an extra $10k. Gaia gives. We are nearing a point of descision with our modes of transport. We a a typical suburban family: 2 kids, 2 (big!) dogs, and two cars. We also live in a small bedroom community that has no grocery store within 7 miles, and we each have long commutes of 7-19 miles. We are a-typical in so far as one of our cars happens to be a Honda Insight that gets 65mpg. The “family” car is a 2005 Subaru Forester that until recently we have loved. In fact we still love it, but are beginning to resent its 28mpg. The Insight is used whenever possible, but the Subaru gets used whenever we all go somewhere. We also have family spread all over and take 4-6 trips to either South Dakota (1100 miles roundtrip) or Ohio (1200 miles round trip) annually which really ramps up our annual mileage to a combined 30-35k, typically 22-25k on the Forester and 10-12 on the Inisght. be in high demand. With my farming off site I use the Subaru many evenings and most weekends, which effectively maroons any family that did not come with. Errands are piling up, frustrations are forming, and when Sprout starts soccer we will be shut down. So it is looking like the Insight may need to go. However, I am very unimpressed with the current hybrid offerings. The Civic gets a ho-hum 45mpg (remember I am used to 65) and I have never warmed to the Prius. One of my numerous faults is elitism, and the space shuttle looks of the Prius are an issue. Both are fairly expensive new, and the used market is VERY high right now. That is also a good thing -I can sell my Insight for what I paid for it 2.5 years and 30k miles ago. The best option may be the 2009 Prius which will get powertrain upgrades and a slight cosmetic overhaul. Both the gas and electric powerplants get a boost and the rumor is of doubling the battery pack to enhance electric capability. Mileage is supposed to improve 10-20% getting it firmly in the 50-60mpg camp. Pricing is allegedly not to change, and my local Toyota dealer has confirmed much of the Hybrid Cars rumors. Another option may be a dedicated “work” truck for the rain barrels and farm. A clean late 80’s 3/4 ton Ford/Chevy diesel can be found for under $5k and converted to WVO for another $1500 or I could make a biodiesel still for about the same or less. Even w/o the WVO the truck would get similar mileage to the Forester towing barrels (22-24mpg). Mia is not pleased about going to a 3 car set-up and there is a lot of wisdom there -we already have alot in the driveway with the utility trailer etc and are considering storage for the Grillo and my monster wheel barrows… Buying another vehicle seems counter intuitive to simplifying life even if it has good arguments. Another strike against the truck is that getting a 4 door hybrid, even the lower mpg Civic, means BIG fuel savings for our errand and road trips. Savings of $80-100/mo look reasonable as the mileage would swap to 20-25k on the new hybrid and 10k on the Forester which helps take the edge off the $24k payments. That whole partial zero emissions is way cool too. All the action on the Sub Acre Farms have been hogging alot of space here at Onestraw, so I wanted to double back and show some of the work that has happened on the Suburban home front. The bed pictured at right was created last year when I made my permaculture beds. 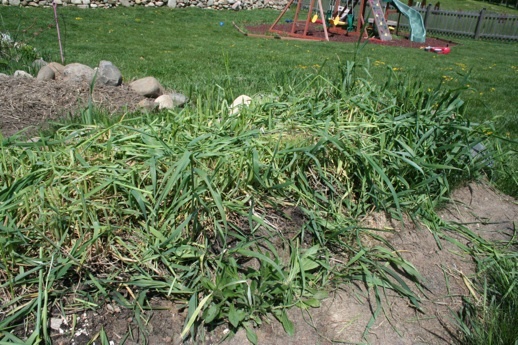 I had taken the sod I cut off with my uber cool hand sod cutter and turned it face down to make a 24″x20′ bed that I then planted with Rye Vetch last September. The winter was fierce here in Wisconsin (second worst on record) and the entire bed top killed to form a 4″ thick mat of straw, only to regrow to this 3′ tall stand by May. I had decided to mow it down for a few reasons. I am still working on when to cut and when not to. Hairy Vetch is notorious for regrowing if mown before it flowers, but more importantly: the Rye was going to seed and I want to plant this bed to tomatoes in 2 weeks. One of the biggest struggles with gardening in a brand new subdivision is the complete lack of organic matter. The soils are dead, and you have no trees for leaves. So last year I began growing my own green manures, primarily Russian Comfrey and Red Clover. Having seen how long it takes the ecologically challenged soils on my property to break down raw materials, I opted to mow off the green growth with a hand sickle. The scrub that is left (at left) I then rototilled under with the Grillo. In the future, I would like to trial the practicality of using a stationary chicken tractor at this point to scratch this layer in over the course of a week or so, but the HOA says “Hell No!” Anyone able to answer why it is ok for me to use a stunningly loud and smelly air cooled diesel tractor in my backyard but not house 6 quietly clucking hens would do a great service to this country. The soil when done bore no resemblance to the dead caked black clay that the sod roots had attempted to pierce last year. Light, rich, and full of organic matter, it was a stark transformation, and the vetch should provide much of the nitrogen to get the tomatoes going. The mown grass netted over 10 cu feet of material some of which I used to supercharge my compost bin (went from 90 to 136 degrees in 1 day!) and the rest to mulch a third of one of the permaculture beds. To review: for $1.50 in seed I prevented erosion, grew my own mulch, accelerated my compost, re birthed my soil, mulched a garden and fertilized my tomatoes. Not bad for watching plants grow for 3 months! 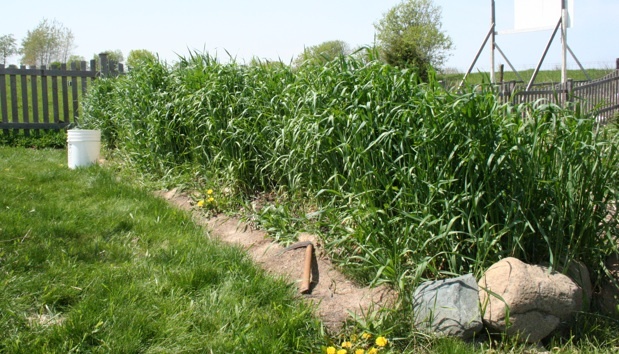 Covercrops and green manures are not just for farming, they play a critical role in ALL soils-even if all you grow each year are tomatoes and zucchini, cover the soil the rest of the year with a simple mix of Rye and Hairy Vetch which can be bought from most seed sellers or Johnny’s or Fedco seeds. Small outlay, little work, and HUGE gains. Kory has been pointing out that I am overdue for some Hoop House shots, and that is mostly because I am overdue for getting into the Hoop House! April here was VERY wet- with decent rains every other day like clockwork. Soil work was out of the question for almost the entire month. About a month ago we moved the Hoop House off the greens we overwintered in it as it was too hot for the Spinach and mache –pictured in the background behind the trash can (full of Comfrey Compost Tea!). 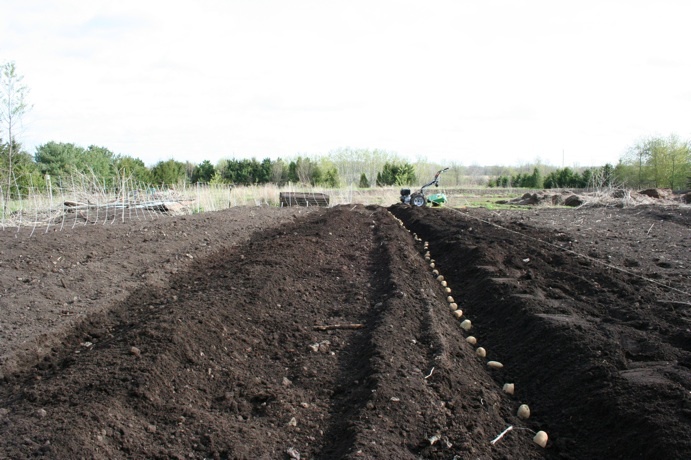 At this time in a smooth system it would have been placed over fresh ground ready to plant, but the ground was not prepped, the Grillo was not in yet, and the soil far too wet for anything bigger. So it sat as a solar heated shed for a month as the soil dried out. The second shot shows the weeds to the south of the house that thrived in the warm, moist air. The ground to the East was turned by the Grillo -more on that in a post this week (hopefully!). The trick was to till all around the house, and then move the structure with the help of 2-3 others. If you click on the pics to expand them slightly you can tell that the structure is free standing, but stoutly built. It is essentially riding on 4×6″ treated lumber which serves as skids, frame and foundation. We are getting better at it: basically you get 2 people per side to prop it up with 6′ levers (pipe, pry bars, whatever) and slide planks under it. Then you lift it again and put some rollers under it -we chopped up some old fence posts last year. 3 per side do it nicely. Then the teams switch to front and back with the back team pushing with their levers, and the front team steering. The ground is not level and we typically fall off the planks a few times, but start to finish we can move a 500#, 12’x25′ structure 30 feet in about 30 minutes w/o a tractor. Nice. So what’s in it? 37 Peppers (Valencia Orange) and 20 Tomatoes( Isis Candy, Oregon Spring, Cosmonaut, and Brandywine). The peppers are on the perimeter as they only get about 2′ tall, and the maters are in 2 rows down the middle. Temp in the house at the time of this shot is 92 degrees with an ambient outside of 68! 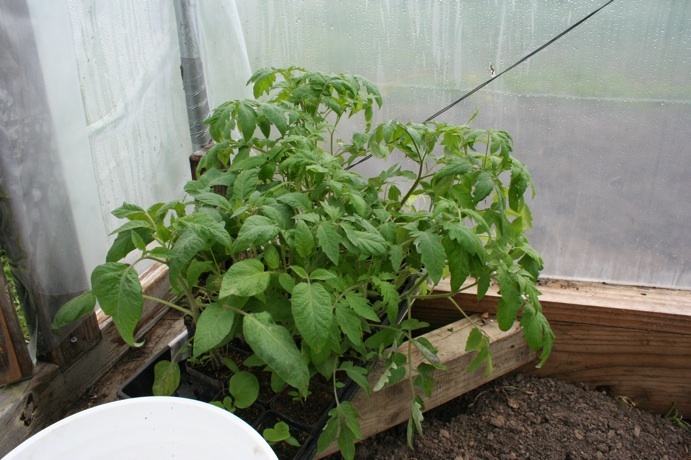 The Tomatoes will be allowed to grow in fairly densely, but are spaced close enough to pick from 3 sides. The paths will be between the peppers and the tomatoes on all 4 sides. As the tomatoes grow I will string some baling wire across the inside of the hoop house about 6-7′ up and then drop jute twine down to another wire line. This will allow the tomatoes to be trained up these for air circulation and ease of picking. I should have tomatoes 4-5 weeks earlier than if they were planted out. Plan your plantings. Next time I will surround the Mini-Maters with lettuce transplants. That way I would be harvesting from the soil for an extra month until the tomatoes fill in. Speaking of tomatoes here are some better shots of the transplants. My first transplants were a decided failure -all spindly and sad. My farming mentor stressed the need to up the intensity so I doubled the lights and this is what I have now! These are the first batch -about 4-5 weeks old and well over a foot tall. They are in 2.5 inch pots and getting a bit root bound. One thing I MUST get better about is not fretting about culling the seed trays. I let 2-4 tomatoes fight it out in there -I planted the trays heavy due to old seed. But come planting time the transplants then have to be teased apart, damaging the roots excessively and hogging time like crazy. The next day I went back to my home transplant rack and counted 96 more pots -each with 2-4 plants in them. My goals are only for 110 plants… I started pinching. When it comes time to plant the tomatoes, I had great success with trenching them. The transplants are about 12″ tall, but I pinch off all but the top sets of leaves. I then dig a long, shallow hole big enough to fit 3/4’s of the plant laying it down, and then carefully bend the last bit above the soil so only the top 4″ are showing (at right). 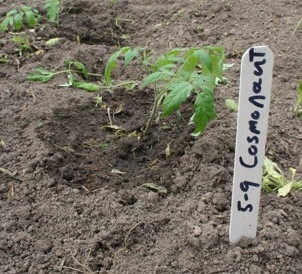 Tomatoes will root anywhere the vine touches soil, so the 8″ of buried vine will send roots out within days, and removing the leaves helps prevent transplant shock. The shallow trench also keeps more of the tomato roots near the soil surface which is the warmest soil in this critical early time -even in a hoop house. MUCH to learn, but Hoop Houses are absolutely incredible tools for stretching growing seasons up here in Wisconsin. 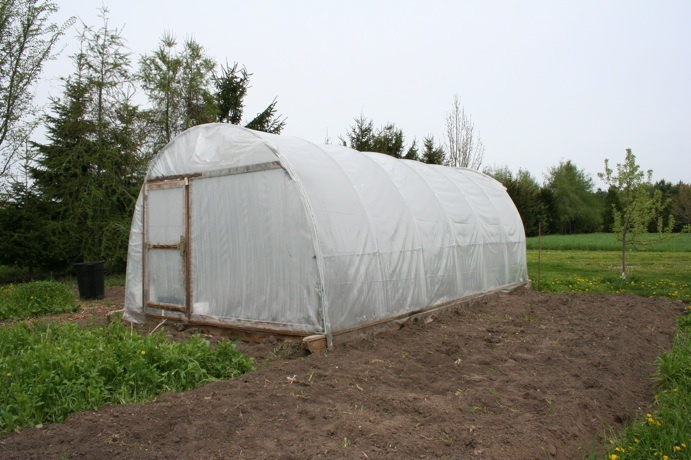 The Hoop House uses about 350 sq feet. With 1600 sq feet you could set up a path grid of 4 400 sq ft spots and rotate the house around it as you overwinter spinach, get a jump on an early set of tomatoes, and leave 1 more for melons/squash in the open air, and the fourth in cover crop. Even if you weren’t growing food, the joy of walking into 90+ degrees of humid air thick, with the heady aroma of tomato plants would be worth it on the crisp May Days! Placed another BIG Fedco Order this morning. Like $367 big. That might not be a Grillo, but it is amazing all the things needed to tool up for market gardening. Included in this order are two set of 600′ of drip irrigation complete with regulators, etc -one each for both farms. Also included is 10#’s Japanese Buckwheat for weed smothering and benificial attractant, 2# of Dutch White Clover for undercropping, a broccolli knife for lettuce harvest, etc etc. Obviously the drip irrigation is the lion’s share of the order. But the regulators and main lines should be around for up to ten years with good storage and care, and the “T-Tape” lines should last several seasons. They claim they can last up to 5-10, but 2-5 seems more reasonable. The freedom and accuracy that the drip irrigation will give me is worth (almost) every penny. Irrigation is now a matter of flipping on a spigot and letting it run for an hour or so while I harvest or weed instead of spending an entire evening a week watering each plot. I am sparing little to no expense -we are relatively cash rich, but time poor right now in Suburbia with our Real Jobs so I am choosing to buy quality (the Grillo) instead of used fixer uppers as I need the tools, irrigation, what have you to start the first time, every time. I get about 90 minutes a day in the field once you factor out my Real Job, transit, and dinner with the kiddos… If you are in the reverse this could be done for a fraction of the cost. I am front loading the expenses. When we move out of suburbia to the townships I will need what little cash we will have for payments, livestock, fencing, tools and the hundred other things that will pop up once we have land. Going in with my irrigation, tillers, hand tools, etc paid for (and lessons learned on!) will be a big advantage. Doubling my mortgage once we have land means that gardening for profit stops being an academic excersize with the first bank bill and I need to have a working business plan in place before I do that. If we get anything larger than 1-2 acres (and I want 5-20) I will need to be able to demonstrate to a banker that I can (and have been!) generate income from growing vegetables. Even though the bills are becoming a bit stressful as we edge in and out of The Black on the balance sheet YTD it all becomes moot every time I fire up the Grillo, pull the soil over the potatoes, or transplant a romaine. “Find something you love doing, and then find a way to make money doing it” Add in the very real aspect of I am helping a dozen people eat a percentage of their food locally while gathering information to help hundreds others do the same and I am feeling pretty good depsite the sore back and pocketbook. The forecast was for still more rain, but it has been spotty and much of the rain missed my farm plots so it was back to the gardens. Wednesday night I was able to get 4 rows planted with help from the family, but much time was spent determining layout and a decent way to do it. Tonight I was able to get 5 rows planted in about an hour or so with the help of the Grillo and my experience from Wednesday. At the picture at left (click on it to enlarge it some) you can see the trench dug by the Grillo (background) and how the rotary plow throws the soil to nicely cover the previous row. the inital trench does need ot be slightly pulled out with a rake for proper depth, but the soil is so fluffled that it is easy work. 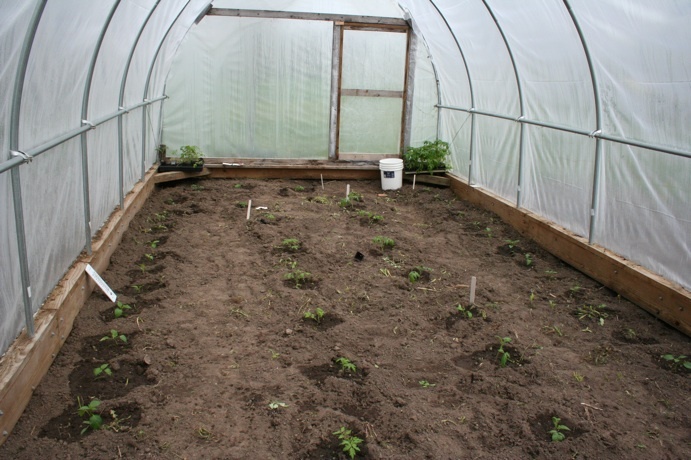 The beds are about 50′ long so one row is about 55 plants. Between the two days I have 9 rows in; about 500 plants! It looks like 190 pounds will work out to about 8-900 plants or 800 row feet -thats allotta spuds. I love potatoes for many reasons. They are a “calorie crop” that can form the base of a meal- tomatoes, etc are mostly sides; they store forever; they are easy to grow; they are a blast to harvest -its the garden equivalent of scratch off lottery cards; and you can get two crops in one season. This weekend I will get the remaining 80 pounds planted and will seed the “aiseles” with carrots and buckwheat. Time and weather permitting I will re till the true market garden beds and make the final call on weather to plant them with veggies or plant a smother crop. 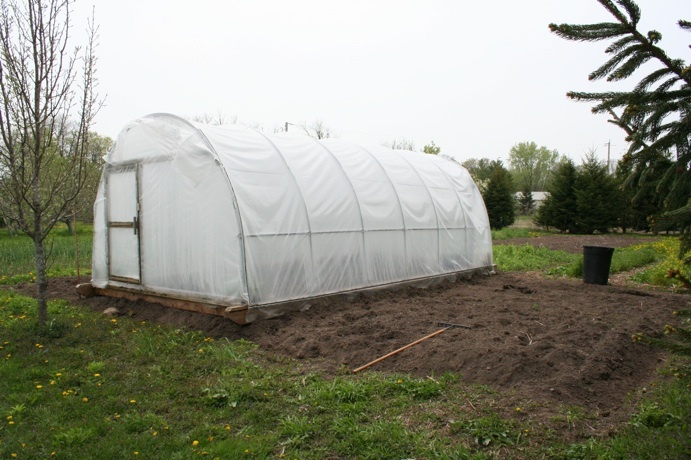 Next week will also hopefully see the hoop house replanted, in a new location, with tomato and pepper transplants.